An exemplary intersection scenario highlighting a use case of the proposed approach. The ego vehicle, depicted in blue throughout this paper, proceeds to an intersection at which it has to yield to. The vehicle has limited visibility and an intersecting vehicle is approaching from the occluded region. The planner of the vehicle has to consider that there might be a vehicle approaching and adequately reduce its speed. Credit: Tas & Stiller. Researchers at the FZI Research Center for Information Technology have developed a new method that could improve the motion planning of autonomous vehicles within uncertain environments or in conditions of limited visibility. Their paper, pre-published on arXiv, outlines a technique to avoid collisions in the worst-case evolution of a given scenario. "Automated driving in urban environments and under harsh conditions is both challenging and remains on top of research," the researchers wrote in their paper. "Adverse weather and light conditions result in poor quality in perception by introducing higher uncertainties and limited receptive fields." The challenges described by the researchers are perhaps of even greater relevance in urban environments, where unexpected events make it harder to predict the outcome of a situation. To address these difficulties, past studies have tried to develop cutting-edge perception systems for automated vehicles. Nonetheless, even the most advanced of these systems, equipped with state-of-the art sensors and technology, often struggle to deal with uncertainty, thus merely reducing the risk of collisions. To address this problem, the researchers at FZI focused on motion planning in an uncertain environment with occlusions. "In this paper we analyzed uncertainties that an automated vehicle is subject to," the researchers explained. "We studied different challenging traffic situations for a vehicle with a limited receptive field." 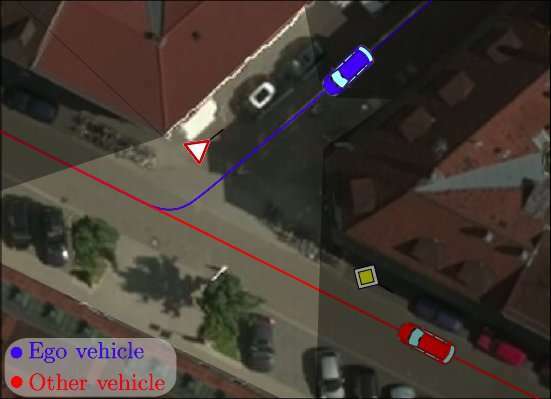 After studying the conditions in which a motion planner needs to consider vehicles approaching from regions that are not visible, the researchers devised an approach to rapidly detect uncompliant behaviors. Their approach somewhat imitates the way in which human drivers typically approach intersections, driving with more caution and at reduced speed. "We present a method to remain collision free for the worst-case evolution of the given scene," the researchers wrote. "We define criteria that measure the available margins to a collision while considering visibility and interactions and consequently integrate conditions that apply these criteria into an optimization-based motion planner." The researchers evaluated their method in a closed-loop simulation environment and found that it generalized well across several different urban scenarios. Their approach has now been integrated into an automated vehicle, called BERTHAONE. "Our future work will deal with more complex scenarios, where a multitude of routes and maneuverer options such as lane changes are available," the researchers wrote.